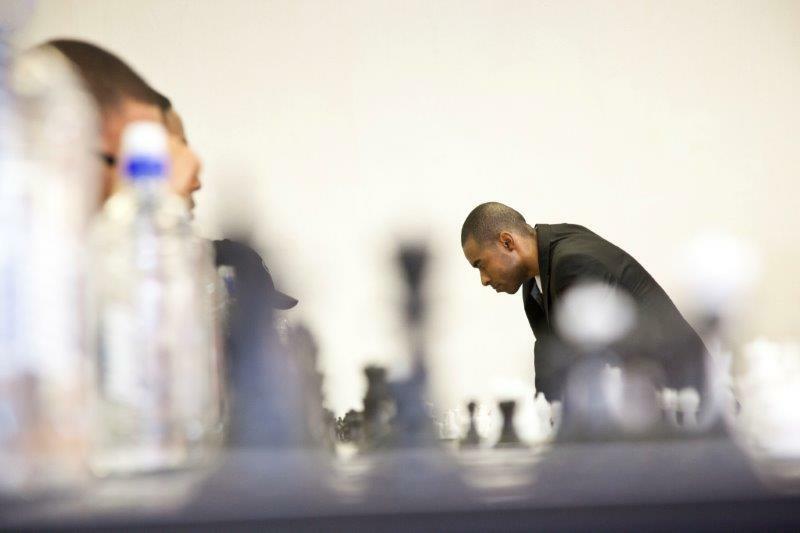 It’s taken many high-pressure, strategic moves for Kenny Solomon to leave his home in Mitchells Plain, travel the international chess circuit for years and arrive at the title of Grand Master. This is the highest chess honour bestowed by FIDE, the World Chess Federation, bar the World Champion title. After two frustrating years as a Grand Master-elect, Kenny won the gold medal at the 2014 African Individual Chess Championship, held in Windhoek this past December. By virtue of a recent change to FIDE’s regulations, he became South Africa’s very first Grand Master. He is only the second Grand Master from sub-Saharan Africa, joining Zambian, Amon Simutowe in holding the hard-won title for life. The odds were stacked against Kenny when he was first inspired by chess at thirteen years of age, which is considered a late age to enter the game if you have your sights sets on a professional career. While at least amongst his seven siblings, he had older chess-playing brothers to learn from and practice with; this was 1992, and chess culture and real tournament opportunities open to a boy in a gang-infested Cape Flats neighbourhood were basically non-existent. Kenny immersed himself in both the history and the current world of chess. His studies of the origins, principles and innovations of the game lit the flame in him for a deep and abiding love of what Kenny compellingly calls, “the inner beauty of chess.” Like luminaries such as Benjamin Franklin, and many other known and lesser known chess devotees, the young Kenny realised and valued that playing chess changes your thinking and the way you see the world, for the better. When he turned his attention to the possibility of making a career from chess, there was nothing but Kenny’s sheer will and determination, his family’s love and the interest from a few fellow club chess players to support him. Unlike young, upcoming players in countries with rich chess cultures who are groomed to succeed, Kenny had to spend valuable years peddling his Grand Master dream in a relatively barren landscape. However, his perseverance paid off in late 2008 when a chess colleague set up a meeting for him at the Mugg & Bean in Tyger Valley Shopping Centre. Kenny didn’t actually have to work too hard to convince the General Manager of SABT (South African Bunkering & Trading) that if he could just tap into the right support he could be South Africa’s first Chess Grand Master. As he says now, “The conviction was in my face”. In early 2009, the African marine fuel supply company embarked on an innovative, lengthy sponsorship that has played a part in enabling Kenny to work towards, and achieve his historic Grand Master title. Kenny readily admits that becoming a Grand Master was much harder than he imagined it would be after he became South Africa’s 1994 Junior Chess Champion and set his sights on a professional chess career and the title. His early years of regular international competition were tough learning years, where the thrill of finally playing against Grand Masters was tempered with the stings of many defeats. “I thrived on gaining the experience, though,” Kenny reveals, “I developed even more perseverance and determination. It certainly didn’t happen every time, but I did play some beautiful games.” All the much-needed experience did start to pay off, and in 2012 the tally of Kenny’s Olympiad wins included the achievement of 3 Grand Master norms. His title changed from International Master to Grand Master-elect, and there were high hopes in the South African chess community that they would soon have their first Grand Master as Kenny needed just 50 rating points to meet the Grand Master requirement of a 2500 rating. But what followed was an unexpected loss of form, Kenny’s rating started to fall and it seemed that the title might well elude him. Despite his meticulous preparation both rounds against the Egyptians were long, concentrated fights for dominance over the board demanding all Kenny’s emotional control and psychological mettle. Once again, his determination pushed him through and he eventually triumphed over Ahmed and tournament leader, Ali to take the gold. A few days later, FIDE confirmed that Kenny had reached his Grand Master dream. Married to an Italian and a proud father of three year old Leonora, a budding chess player on her own terms, Kenny has lived in Venice over the past few years, which grants him easier access to international competitions. He remains registered as a South African player with FIDE and he has a keen interest in promoting a richer chess culture in South Africa. He has made several trips home to participate in competitions, exhibition games and initiatives with the hope of encouraging young South Africans from under-resourced communities to brighten up their lives by turning their minds to the chessboard.